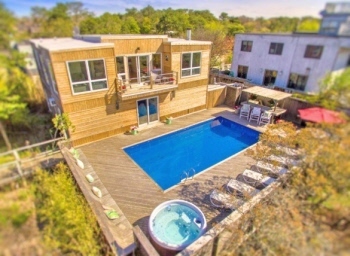 Classic Fire Island Pines beauty with a nod towards Mid-Century architecture encompassing all of today?s modern amenities. Over sized living room with high ceilings, vintage cone shaped fire place and floor to ceiling glass sliding walls. Separate dining room. Gourmet kitchen. One of the four bedrooms is the famous all- mirrored bedroom suite! 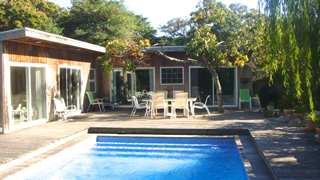 Large sunny heated pool with hot tub. Large lushly landscaped lot. A sprawling pool deck that can not be rivaled. Sun all day on this beautiful deck that is surrounded by lush landscaping. The house is maintained impeccably. New Anderson sliders thru out, open kitchen, great flow between out door and indoor living spaces, four spacious bedrooms, three renovated baths, 2 out door showers and very well maintained. Pines Harbor Realty Exclusive. A rare find. 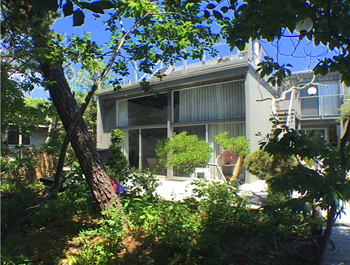 We hear it all the time��Find me a dreamy mid-century house on the Bay��WE FOUND IT. This beautiful house has what you�re looking for. Open living room with big windows and high ceilings. Gourmet kitchen has new appliances and bay views. Fantastic master bedroom with beautiful in-suite bathroom and private veranda. Two additional bedrooms share the second bath. Lovingly renovated throughout. 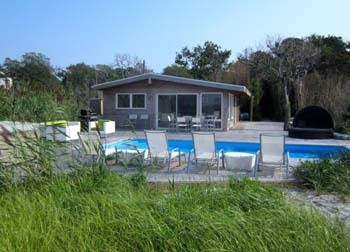 Big sunny pool and hot tub directly on the Great South Bay. Over-sized private DRY lot with 75 feet ON the bay. Pines Harbor Realty Co-Exclusive. 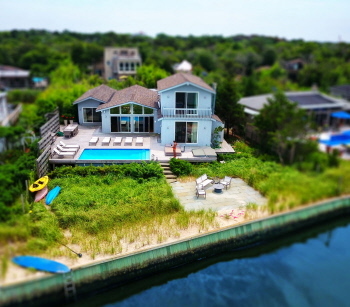 Bayfront living is the ultimate luxury in Fire Island Pines. Combining the views of the bay and the privacy of waterfront living , homeowners are rewarded with a serene setting for relaxing and hosting. The house is uniquely detached from the main thoroughfare by a private walkway leading to the main gate. 609A Shore Walk has 4 bedrooms (2 master suites, 2 guest bedrooms), 3.5 baths, with an outdoor shower with bayfront views. The larger master suite is the only structure on the second floor, affording complete privacy for the owners even if the house is full of guests. A large foyer welcomes residents and introduces visitors to the great living space overlooking the deck, the pool, and the bay. Meticulously curated and relaxed furniture throughout the house makes you feel at home right away. Enjoy long gazes into the bay view, or host 100 of your closet friends for a BBQ. It's all here at 609A Shore Walk. Beautifully maintained house. Three bedrooms plus a lovely studio apartment. The studio is a separate structure that is adjacent to the main house. 590 is great income producing property. This house was re-done in the last couple of years. 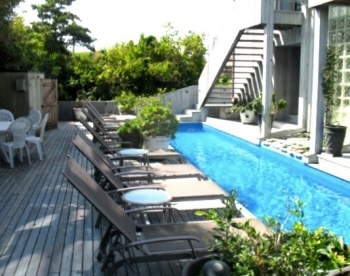 Nestled in the west side of Fire Island Pines for complete privacy. A beautiful pool deck with ample sun. 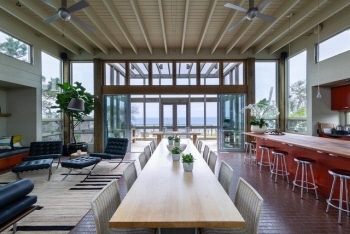 Beautiful hard wood floors thru out and walls of glass to have bright and airy living quarters. Gorgeous master bedroom and renovated open kitchen. This house has a great flow between indoor and outdoor living. Pines Harbor Realty Exclusive. Grand two-story contemporary on an oversized DRY lot. (80� x 100�) Bright and breezy great room with big windows, high ceilings and a fireplace. Open newer kitchen with nice appliances. 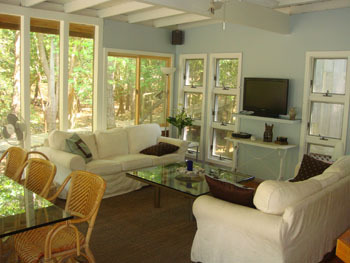 Four air-conditioned bedrooms with four full bathrooms. Large sunny upper and roof decks with bay views. Great pool deck and private hot tub area with outdoor shower. Must be seen to be appreciated. Gracious living can be yours. Oversized great room with high ceilings, walls of glass and a wood-burning fireplace. Beautiful pool area. Lush landscaping. Roof deck. Total Privacy. Exclusive! 583 Seaview Walk. 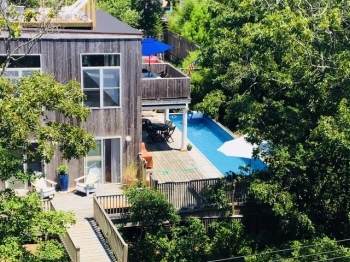 A wonderful two story contemporary with charming tree top views and steps to the ocean. 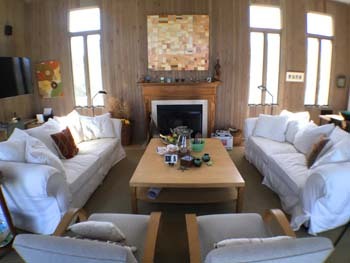 583 has a great room that is richly proportioned with a grand entertaining and living space. Featuring 2 living rooms, a full bath, WBFP, large dining area open kitchen and Juliet balcony. There are 4 large air conditioned ensuite bedrooms. The pool deck is sprawling. Has all day sun, hot tub, out door shower and wet bar. 583 Seaview also gets an amazing rent roll for an investor. 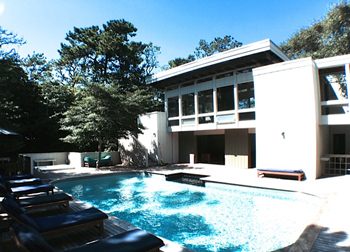 One of the most iconic houses in The Pines is for sale. This house is majestic. It has seven bedrooms and five baths. An amazing income producing house. Has a pool with all day sun, an indoor spa room, a widows peak with ocean views, 2 washers and dryers and floor plan that is ideal for entertaining.